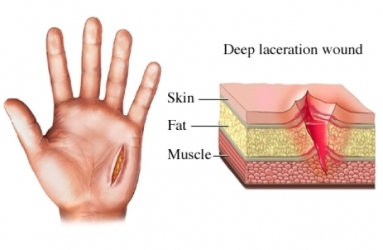 A laceration is a tear or cut in the skin, tissue, and/or muscle. They can vary in length, depth, and width. A laceration repair is the act of cleaning, preparing, and closing the wound. Lacerations that are shallow, small, not bleeding, and clean may not need medical care. Antibiotic ointment and a bandage may be all that is needed. Wounds may also need medical care if there is risk of tetanus . This is a bacterial infection from dirt, dust, or feces. A deep or contaminated wound increase your risk of tetanus. Medical care may also be used if there is a concern about scarring. Apply direct pressure to the wound. Use gauze, a clean cloth, plastic bags, or, as a last resort, a clean hand. If the wound bleeds through the gauze or cloth, do not remove it. Add more gauze. If possible, elevate the wound above the heart. This will make it harder for blood to flow to the wound. Do not tie a tourniquet around an affected limb. This may cause more damage. If bleeding stops, let some water run over the wound. Tap water is safe to use. If muscle, tendon, bone, or organs are exposed, do not try to push them back into place. If you are feeling faint, lie down or sit with your head between your knees. Local anesthesia is used for minor lacerations. This will numb the area around the wound. General anesthesia may be needed for severe lacerations. It will block pain and keeps you asleep. In some cases, no anesthesia is needed. The wound will be cleaned and prepared. Hair the may interfere will be trimmed and smoothed away. Sterile water will be squirted into the wound. This will help wash away dirt and debris. A soap or antiseptic may be used to clean to surface around the laceration. If necessary, some jagged edges will be cut away. This may help the laceration close easier. Damaged or dead tissue will be removed to prevent infection. Dermabond is a special glue that holds a wound together. It is used on the face, arms, legs, and torso. It can also be used on small lacerations. It is not used for lips, lacerations that are over joints, deep lacerations, or most hand and foot lacerations. The laceration will be held shut. Next, a thin layer of Dermabond will be applied over the area. Warmth may be felt as the glue sets. Dermabond will be applied in 3 coats. The wound will then be held in place for 60 seconds. A bandage may be placed over the area over the wound. Note : The glue sits on top of the laceration. It is not placed in the wound or between the edges of the wound. Never try to repair a wound at home with glue. Getting glue into wounds may prevent them from healing properly. Steristrips are adhesive strips that help close the laceration. They may be used in lacerations that are clean, shallow, have straight edges, and are easy to push closed. The doctor will align the edges of the wound. The strips will be applied across the wound. Stitches, are used for wounds that are deep, bleeding, have jagged edges, or have fat or muscle exposed. The area will be cleaned with iodine. A surgical drape may be positioned over the wound. This will keep the area sterile. If a laceration is deep, stitches may be needed under the skin. The stitches used under the skin will be absorbed by the body. They will not need to be removed. The wound will then be stitched shut. Once the wound is closed, saline will be used to clean the area. A thin layer of antiseptic ointment may be applied, as well. A gauze pad may be placed over the stitches. An elastic bandage or tape may be placed over the gauze to cover and protect them. Staples are best suited for the scalp, neck, arms, legs, torso, and buttocks. Iodine will be applied to the skin surrounding the wound. The wound edges will be closed and aligned. Staples will be placed along the wound. Saline will wash the staple line. The area will be patted dry. An antibiotic ointment will be applied. A clear acrylic dressing called Tegaderm will be placed over the staple line. A gauze pad and tape will be placed over the area. Hair tying is used for some scalp lacerations. Hair will be gathered in a way that pulls the wound shut. The hair will then be rubber banded or held together with dermabond so the wound remains shut. This depends on the laceration. It may take less than 15 minutes or more than an hour. This also depends on the laceration. Severe lacerations will be very painful. Ask your doctor about pain medication. Following the procedure, the staff may provide the following care to make you more comfortable and help your recovery. This may include pain medications or antibiotics. Take antibiotics and pain medication as directed. Follow instructions about when it is safe to shower, bathe, or soak in water. If you need to keep the incision area dry when showering, wrap the area with a plastic bag. After showering or bathing, pat the area dry. Do not rub the area. Also, do not apply hydrogen peroxide or iodine to the wound. This will damage tissue and slow healing. Do not pick at or scratch the wound. This may lead to poor healing. Dermabond will fall off in 5-10 days. Steristrips will typically be removed after 5-10 days, or they will fall off on their own. Stitches will be removed after 5-14 days. Staples will be removed after 5-10 days. Rubber bands will be cut from hair in 7-10 days. Note : Do not try to remove the closure material. Removing materials yourself may lead to infection, scarring, or reopening of the wound. If a noticeable scar does result, plastic surgery may be used to decrease the scar’s appearance. Redness, warmth, swelling, drainage or excessive bleeding occurs at the wound site. Beam, JW. Wound cleansing: water or saline? J Athl Train. 2006;4(2):196-197. Burns T, Worthington J. Using tissue adhesive for wound repair: a practical guide to Dermabond. Am Fam Physician. 2000;61(5):1383-1388. Joyce MP. Routine vaccine-preventable diseases—tetanus. Centers for Disease Control and Prevention website. Available at: https://wwwnc.cdc.gov/travel/yellowbook/2018/infectious-diseases-related-to-travel/tetanus. Updated May 31, 2017. Accessed December 21, 2017. Laceration management. EBSCO DynaMed Plus website. Available at: http://www.dynamed.com/topics/dmp~AN~T129892/Laceration-management . Updated October 25, 2016. Accessed December 21, 2017.